Inner City Home began on the initiative of Father Don McMillan, a former pastor of St Patrick's Roman Catholic parish who began the impetus for the Home in 1986. The parish funded the initial start-up costs and the purchase of our building. 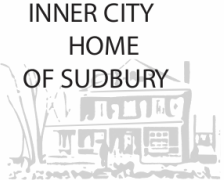 Just as today there was a need to provide services that were lacking in inner Sudbury's core. Initially the impetus was just to provide counselling and hospitality. While the Home was a Catholic undertaking, religious affiliation was not looked at nor do our Board of Director's today have any particular religious affiliation. We are a registered charity able to give tax receipts for donations. The Food Bank function of the Home came about almost by accident and out of a growing awareness of the need for food as a primary need which coincided with co-operation from the Catholic Charities Soup Kitchen which made surplus food available. Our sources of food are donations fro many local businesses that provide surplus food. Donations are also received from regular food drives carried out by local churches, schools, numerous services, organizations and other services.